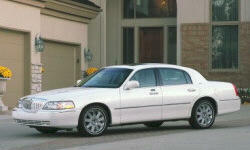 Lincoln Town Car Pros and Cons | Page 1 of 1 | Why Not This Car? What drives people to buy (or not buy) a certain car? 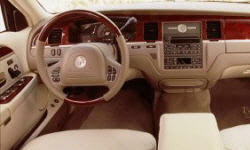 TrueDelta's members share Lincoln Town Car pros and cons based on their real-world driving experiences. It drives like a Lincoln Town Car. These cars are know to go well over 500,000 miles with no major repairs if serviced regularly. This is why they are so popular with the airport limo drivers. There is no center console and the seats are wide. Own a 200 Crown Vic - same platform. Only had two very minor repairs (sensors) in eight years. Built to last forever. Bulletproof engine. Town car plant no 1 plant in North America for initial quality. Everything built solidly. Proven design. NHTSA awarded the 2003 Town Car with its highest rating, 5 stars, for collision safety in every category the government could think of. The Town Car also features durable body-on-frame construction.